Family, fun and education are what we are all about and our awards were set up to find and celebrate the best games in their field from all over the world. 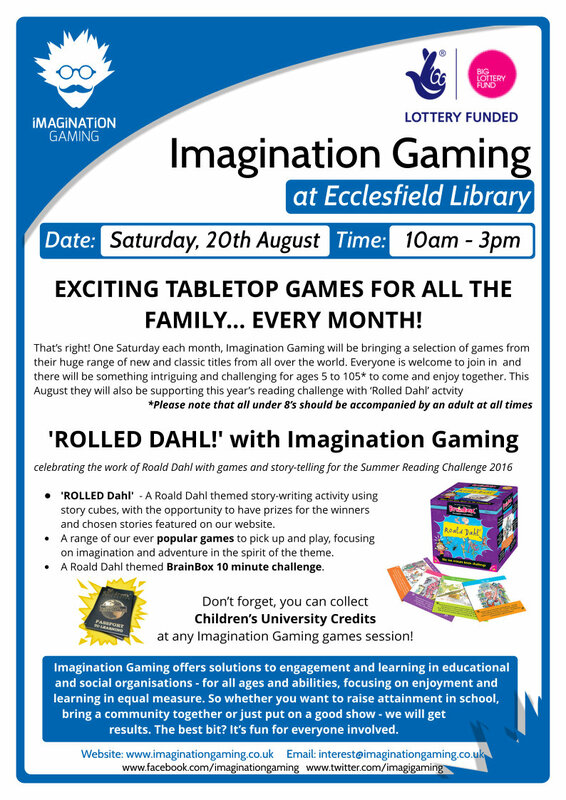 Many of the categories represent our work in schools and we are looking for those games that can teach literacy, maths, cross curricular subjects and problem solving skills in a fun, creative and imaginative way as well as those that are just wonderful family fun. This year we have been spoilt with nearly 100 games entered into the awards across our 10 awards categories from some of the most exciting games designers and publishers out there. This spring was like a mini Christmas every week as we opened box after box of exciting new games. We thought we had seen a lot of family games but our minds have been blown by all the interesting new themes and game mechanics we have seen this year. Long story short… We all have very long Christmas lists now! We can’t possibly mention all the great games we have seen but we would like to share some of our team’s personal favourites and some stories from the awards. Literacy is dear to our hearts so we were very excited to see the games in this category. Werewords from Bezier Games (Literacy – Gold, Family - Gold) grabbed our attention from the beginning; lovely graphics, clever game play, with a perfect app to accompany the card game. Guess the secret word to save the village from the werewolves but secret roles may help or hinder the villager’s efforts. Word Bits from The Green Board Game Company (Literacy – Silver, Family – Bronze) is a fast, frantic word game where a category and the letters from a number of dice set the scene for players to call out words that fit. Playing this in school with a group of 10 year olds had us reeling… a word containing the letters F and R that is a game? The children couldn’t yell “Fortnite” quick enough or loud enough! Maths made easy was what we were hoping for and that is what we got times 2! Alana’s Animals from Think Noodle (Maths -Silver, Family – Silver) and Chicken Out from Gibson’s Games (Maths – Gold, Family – Gold) were wonderful little card games that get kids doing maths without them even noticing and proves that great things do come in tiny packages! Alana’s Animals wants you to count cute farm animals and apply basic maths concepts such as bigger than, this but not that and most/least whilst having a ball on the farm. Multiple games to play with the card set that grows with ability mean that families will go back to this game again and again. Chicken Out is a fab, kid twist on blackjack. Add chicken cards to the row without going over 21 or chicken out for less but definite points; what children won’t go crazy for a little light gambling with chickens?! Basic arithmetic skills are improved by this clever game. Cross Curriculum saw us getting into a hot debate over a game of Vote Me! From Redwell Games (Cross Curric – Bronze, Family – Bronze). We loved watching the families debate the merits of doughnut policing… We were laughing so hard we could barely vote! Can You Hear Me? from Vision Works (Cross Curric – Silver, Family – Bronze) was another interesting game which our web developer guru was insanely good at! A great PSHE tool, it turns out that watching Japanese anime makes you a super expert at decoding the wonderfully drawn cartoon characters emotions. We were all in awe of his empathic prowess! Choosing a game from the problem solving category was a conundrum (get it?) but Match Madness from Asmodee (Problem – Gold, Family – Gold) and 13 Ghosts from Artipia Games (Problem – Gold, Family – Gold) were stand out contenders for the IG team. Match Madness looked good, had simple ‘arrange the blocks to match the picture’ game play but was devilishly addictive… They tried to make us go to rehab but we say No, No, No! 13 Ghosts must be the cleverest and spookiest deduction game on the market – the IG team were terrified at how good this game was. Beautiful artwork supports the simple task of deducing which numbered ghost from 1 to 13 the other player is holding in their secret vault while they try to deduce yours. So simple, so clever, so playable, again and again. Family games are close to our hearts and we watched one of the team’s eight year old daughter swoon over one choice while her mum lost her heart to the other. The little girls love was Quirk Legends from Emmerse Studios (Family – Silver). A modern and wonderful take on Happy Families or Go Fish, this lovely little game gets you making the noises of creatures of legend to ask for the cards you need. What noise does a unicorn make? One little girl we played with thought long and hard before putting her hands to her head to make a horn and exclaiming sweetly… “Magic Horse!”. Just perfect! The grownups choice was That’s a Question by Czech Games Edition. How well do you know your opponents? What questions can you predict their answers to? Which questions will you choose? and What have squirrels got to do with it?? A family friendly, ethics questions game got the award administrator asking her IT obsessed other half “which would you miss more? touch screens or romantic evenings?” Needless to say we had much more fun watching him squirm that he had trying to answer that one! We should also mention that the rule book is the funniest thing we have read in forever! Well done Czech games for making the rules almost as good as the game! If we are being very honest, Young Einsteins is always a hard category for us to choose from. Our little ones are not so little anymore but when they were, we remember long afternoons playing ‘baby’ games that made us want to sit in a corner throwing breadcrumbs at ourselves so we were delighted to see the new generation of littlies games that adults can actually enjoy playing too. Both choices are from HABA Games and we think they are great. Tiny Park (Young Einsteins – Bronze, Family – Bronze) has a lovely, yatzee-style game mechanic, where picture dice rolls help you to build a tiny theme park. Teaching children spatial, shape manipulation skills and enhancing their ability to predict and judge risk, Tiny Park is a lot of fun for grownups too. Silly Shenanigans (Young Einsteins – Gold, Family – Silver) is a lovely little game about pixies who love toys. Involving actually hiding glorious little wooden toys in a secret toy cave, this game asks children to use their memory to remember the toys hidden in the cave and use their deductive reasoning to decide if they need a given toy based on its colour and shape. The children we played this with were so engaged with this game and we have to admit we love setting the scene for them, explaining about the naughty pixies who take the toys and hide them in the little cave and how they have to be clever and win them back! Sweet, fun and a bit smart too! Last but not least we have to mention The BIGGY… When I Dream from Asmodee (Literacy – Gold, Family – Gold). What can we say? We could not have dreamt of a better game. Beautiful artwork, a lovely three dimensional board, a blindfold and the dreamer’s imagination. Players give clues to objects to the blind folded dreamer who guesses the object and then has to remember it to later include it in his dream. Points are awarded for accuracy of guesses and accurate recollections but the dreams themselves are as fantastical and inventive as real life! A wonderful night of family fun that we cannot recommend highly enough. The full list of winners can be found on our Imagination Gaming Website Award Winners page and we would like to finish with a huge thank you to all the judges, the families visiting our Family Zone at the UK Games Expo, the IG team and of course the wonderful games designers and publishers whose support and participation have again made our awards such a great success. Thank you all and see you again in the Autumn for the 2019 Awards! This week, we held an Inter-School Tournament, but instead of holding it in our usual Primary School setting, we ran the event at Huddersfield Library! We split up our 2 school participants into teams, who'd compete for the most points in rounds of different games. A special thanks to all the staff for keeping an eye out and looking after our teams! Storyline Scary Tales - create to spookiest tale imaginable to win points. Monster Trap - trap monsters by working together to control movements! Dobble - be the first to match icons with other players cards. A huge congratulations to the winners of the day, Spring Grove and overall winner Jennifer Nguyen! They grabbed themselves a trophies to show off at their school with pride. Well done! 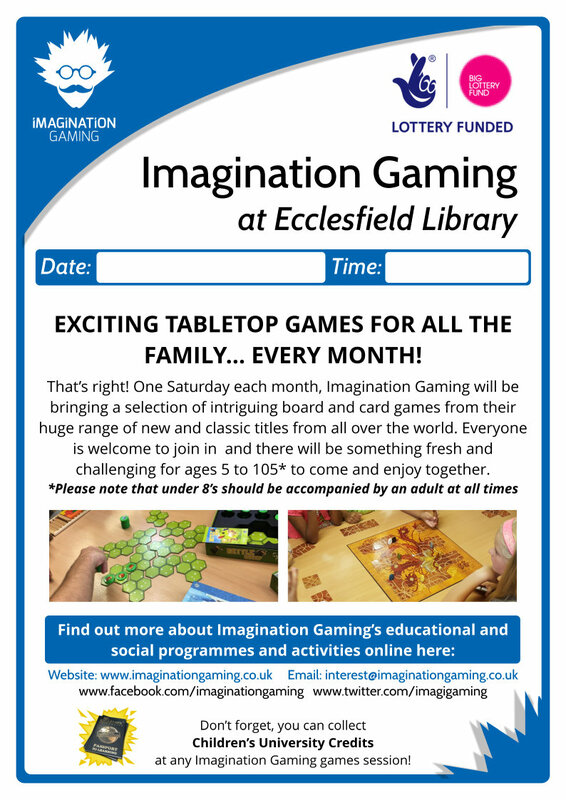 First and foremost, we’ll have a great selection of family games. We’ll have our own games library filled with a mixture of old classics, what was popular with attendees last year, as well as some brand new one's we know you'll fall in love with! After recently returning home from Essen this year, we've got a lot to show you. The Friday will be a Tournament day! We're giving the chance for schools and attendees of the event to take part in some amazing tournaments with great prizes! More information will be released soon, but if you or your school are interested in spending a day in Harrogate with us to compete in our tournaments, then get in touch with us at interest@imaginationgaming.co.uk and we'll send you more information! The Saturday and Sunday of the show will be the time where we can demonstrate and show off our great new range of games (this still applies to Friday too, as well as the tournaments!) You'll be able to play some brand new Award games for 2018 and give us your feedback, as well as a ton of skill builders and ones to really get your brain working! Tickets are available on the AireCon website here. There are discounted youth tickets and kids go FREE! Well Essen is over for another year, but things aren't all bad! We had a fantastic time chatting to our friends in the companies we know well and making friends with new ones. There were so many exciting new games on show, (a few of which we'll tell you about at a later date) but there were definitely some that are worthy of a mention! Dream Catchers is a cooperative casual game where players are dream catchers - they visit children in their sleep to collect sweet dreams and remove nightmares to help them sleep for the night! This one is for the older kids, but is great to introduce cooperative play and definitely has strategic elements to it! In Worm Party, players attempt to escape the nibbles of Charly the chicken by hiding their wormlike fingers below the proper mounds. This one looked like fun and was definitely great for dexterity building! In Coaster Park, you are tasked with building the biggest, baddest roller coasters. To do this, you must assemble a killer crew to help you outbid and outsmart your fellow builders to gain the choicest track pieces. But don’t forget about physics! This one is another great one for dexterity and really brings something different to the table. From the creators of the extremely popular Kingdomino, here comes Queendomino! This is a game completely independent from Kingdomino, while offering a choice of more complex challenges. Two to four players can play Queendomino independently, but also in connection with Kingdomino, allowing for games with 7x7 grids for four players, or for up to six players if you stick to 5x5 grids! As with Kingdomino, a great tile placement game with strategic elements! We have plenty more to share with you, but we don't want to give too much away too soon...watch this space! Did you attend Essen this year? What were your highlights from the show? Our friends at Green Board Games have been absolutely amazing and have sent us a huge pack of games for our team members. Our team has expanded (more on this later!) so we're able to showcase these games all across the country in true Imagination Gaming style. 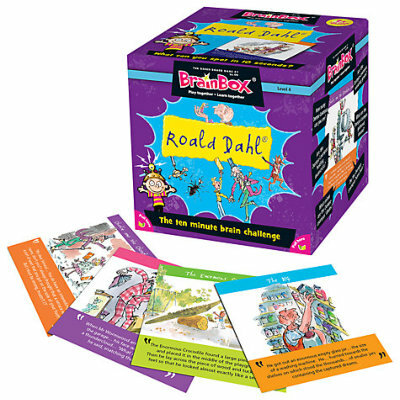 Of course, the BrainBox collection is definitely up there in our top 3... we've used these so many times over the years we've lost count! Thanks to Green Board Games, we now have a more extensive collection, including BrainBox Dinosaurs, Animals and Nature! The object of the game is to study a card for 10 seconds and then answer a question based on the roll of a die. If the question is answered correctly, the card is kept, and the person with the most number of cards after 5 or 10 minutes is the winner. A simple but fun and effective way for the younger ones to get their alphabet and numbers in the correct order! These are great as they can be used for an independent task as well as team building activities. Flags and countries seem to be a difficult one, but Fast Flags will get you learning the countries in no time! We've already begun to use the games in our school activites day to day and we can't wait to get started with our new activities! Internationale Spieltage SPIEL, or otherwise known as the Essen game fair is talking place from 26th - 29th October, and gamers from all over the world are getting ready to see what this year's show has to offer... including us! So...what is it? The event is held in Essen, Germany and it's the world's biggest consumer fair for gaming. People travel far and wide for the event, which is held over 8 different halls. (If you've ever been to the UK Games Expo, think of that, but eight times as big!) As you can guess, it's always a very popular event and is also very beneficial for gamers and companies in the field. As fun and awe-inspiring as the event is, we don't just sit around for four days playing games, (although we do try out a fair few!) The main reason for us being there is the chance to catch up with our favourite companies and to see what exciting projects they're working hard on and in turn, what new games and activites we can bring to you in schools and in the many events we run each year. It's also a great way for us to know about new games for our Imagination Gaming Awards held each year. So, a very exciting time for us! We'll have more information to splash about after the event, so watch this space! Over the last few weeks, we've begun to use a range of games from John Adams, a company who stocks a huge range of fun family games as well as science and craft kits! Here, we've picked out a few of our favourites for you to feast your eyes on... you may have even spotted these games if you've been to our events recently! Which have you tried? This one is a super simple, shouty-outy quiz game. It's nice and easy in the fact that it only takes 2 minutes to learn, but it's one of those games that you can enjoy for hours on end with a high replayability factor! The game is played by simply answering the four questions on a card and spotting the link between the answers faster than the other teams. When you're the first to get an answer correct you win a letter, and the first to spell 'Linkee' is the winner of the game! If you prefer games that really make you think, then this is the one for you. Othello takes a minute to learn but mastering it isn't as easy! With abstract strategy and a little bit of luck, you can beat your friends and impress new ones! To play the game, you trap and capture your opponent by placing your disks on the board. "Sandwich" at least one of your opponents pieces to turn their disk to your colour. However, look out...your opponent will try to do the same to you! The lead can change with the flip of a disk! This one is a fast paced category word game that challenges players to think quickly! The way you play this one is simple. You choose a category card and press the timer to start. The first player has ten seconds to say a word matching the category, press the correct letter on the wheel and reset the time for the next player. The game will get more and more difficult as the letters get used and the pressure will mount! If you can't think of a word, then your out. A really good game to get your brain into gear and for helping with vocabulary too! Based on the good old fashioned Rubik's Cube, here is Rubik's Race! This one is the ultimate face to face challenge and it's pretty simple to get your head around (although it might take a while to solve!) Each player slides their tiles trying to recreate the Rubik's pattern and to be the first to drop the divider frame on their completed side of the board. This one may take a bit of patience, but as with the original Rubik's cube, it'll be very satisfying when completed! There are many more fabulous John Adams games that we'll be using more of over the coming weeks, so keep a look out! Which of these great games have you tried so far? Our friends at Big Potato had a chat with us a couple of months ago and showed us a few of their new games. They were also very kind and sent us a few so we can show you just how good they are! We’ve already awarded The Chameleon a Family Silver Award in this year’s Imagination Gaming Awards, so let’s see what else they’ve got up their sleeve…. Qwordie is a cute little word game and what makes it even better is the platypus! The game is a quiz and word game blended into one. You use your letter tiles in the game to build the answers to simple quiz questions. Steal tiles, block your opponents and race to the finish line! We love this quick to play and easy to learn gem! According to Big Potato, 'OK is the world's most understood word, so makes the perfect name for the world's easiest to understand game' and we couldn't agree more! We think this game is a little bit like Connect 4 in the way that it plays, only that it's played on a flat surface instead! All you need to do to play is to choose a colour stack and proceed to put down tiles to try and get a line of 5 before your opponent does. That's all there is to it - a great and easy to play game, but you need a bit of strategy to win. This angry rainbow is in a mixed up mess and its your job to fix it! In Rainbow Rage, you really have to observe the colours of the rainbow carefully. You flip a card which will reveal a rainbow image with something not quite right...your job is to be the first to grab the colours that have switched places, so having a good knowledge of the colours of the rainbow may help you in this one! Watch out for traps, but observe carefully and you'll be victorious! Here's super new one which we really like! Do you know your colours? Probably. But do you know colours of things/object just from a few words? As simple as it seems, it can get a little tricky! In this game, you start will 11 colour cards and you have to choose the right colour to answer the questions. To get more points, you need to hope and pray the other players get the answer wrong. You really need to get your brain in gear for this one, but a great mental challenge! We had a great time at this year's UK Games Expo and met loads of our friends at a variety of companies, new and old! We met the team at HOT Sports and games and had a demonstration of some of their range, including Qango and Virus! Here's a bit more info about these games, which we have available to play! Qango is an abstract, strategic boardgame for 2 players that plays quickly and can be explained very quickly! Players place their discs on a square multicolored board and try to either get 3 of their discs in one group of the same colour, 4 discs in a square shape, or 5 discs in a horizontal, vertical or diagonal row to immediately win the game. Players place one disc at a time and aren't limited in how to place the disc after the first move. The game includes 2 boards: a beginner board with 6x6 squares and an advanced board with 7x7 squares to really up you game! Gang-Up! is a criminally fun cardgame. Your aim is to try it out as a criminal to gain the highest possible status. Sometimes together, sometimes by arresting the other players! How will you get on? This one is suitable for 3 to 5 players. We pride ourselves on giving the best possible service, and definitely the most fun! Saying this however, we want to make what we do even more exciting and engaging than ever before. Without giving away too much information just yet, we're currently looking at expanding our services to make what we do even more beneficial. Our friends at Thames and Kosmos have some of the best science based activities and puzzle around and we were very lucky to get our hands on some! I wonder what we'll come up with...watch this space!